As you probably realize, SEE is a small museum, especially when compared to the big science centers in Boston, New York and Chicago for example. 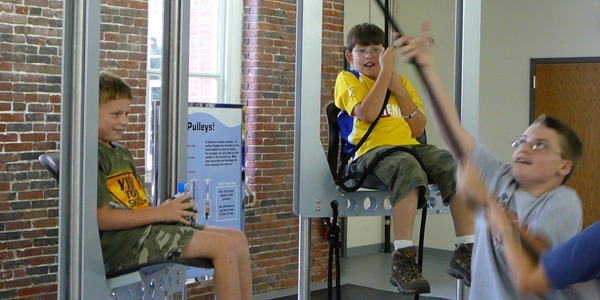 (BTW you can use a SEE membership at science centers large and small all over the country for reciprocal benefits). And because we are smaller we don’t have any evaluators on staff. What do museum evaluators do? Well, they make sure all the exhibits, programs and endeavors of the organization are in line with its mission and goals. That is very important! SEE is very grateful to have recently had two volunteers, Jake and Jo, undertake the evaluation of SEE’s exhibits. Their report and continued efforts will help SEE make plans for how to better serve our community with our exhibits in the future. As a member of SEE’s community your input is important as well. We listen to customers comments when they visit or write to us. We read what people say about SEE on sites like Trip Advisor and Yelp. And we try to incorporate the comments in what we do. A great example is the return of the train engineering exhibit for early explorers last summer after Charles successfully advocated for the return of his favorite exhibit. Read our blog post: Inspiring and Enthusiastic SEE fans to learn more about his efforts. So as we take a fresh look at our exhibits, leave us a comment, let us know which exhibits are your favorite and which ones really helped you or your family learn something new about science! By seesciencecenter in Uncategorized on July 10, 2015 .